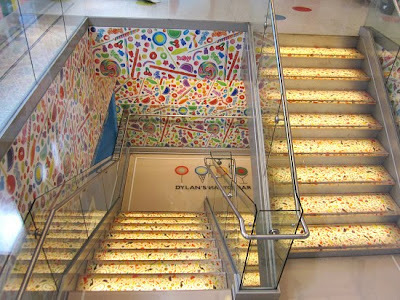 Dylan's Candy Bar, on Third Avenue and 60th Street in New York City is not just any candy store, it is a fantastical candy experience! It's like walking thru a giant kaleidoscope, except the colored mosiac is candy. 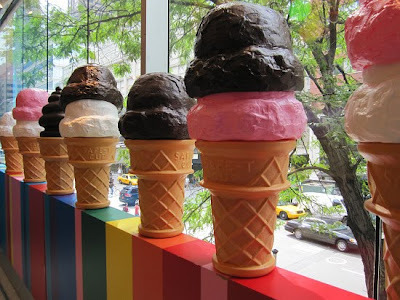 Delectable images of candy are embedded in the architecture like over-scaled lollipop columns, candy-inspired lighting, back-lit candy shapes on its staircase, oversized ice cream cones, peppermint barstools,gumball tables and the attention to detail goes on. The Founder and CEO of this wondrous world of candy is Dylan Lauren, daughter of the infamous fashion designer, Ralph Lauren. Like her dad, she has created a shopping experience, but one with a whimsical twist. Dylan's Candy Bar is a destination for all ages because, as we all know, the scents, the flavors and the colors of candy makes us all happy! I was able to interview Dylan Lauren. 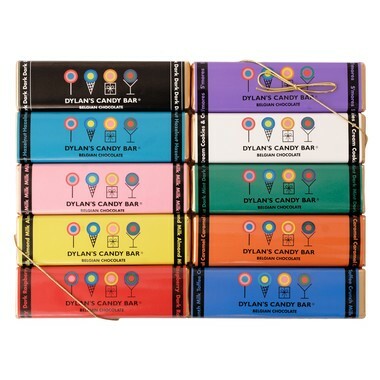 Learn more below as she describes her creative process and influences that impacted the design of Dylan's Candy Bar. 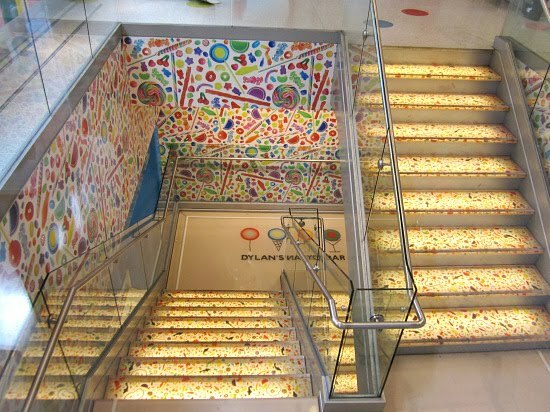 A great architectural element with back-lit candy images in the Staircase Treads! 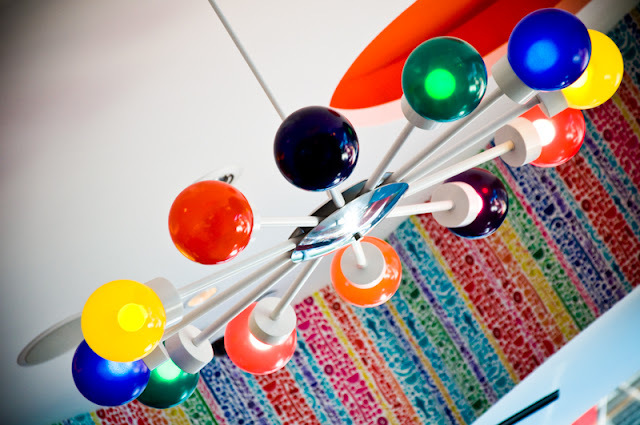 LOLLIPOP ARCHITECTURE - WHIMSICAL LIGHT FIXTURES! No great designer exists without inspiration. 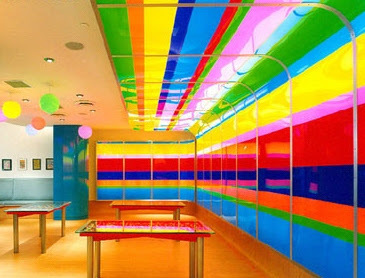 So, I reached out to Dylan Lauren to take us behind the design of Dylan's Candy Bar and its colorful candy designs and asked her how did the interior-architecture come to be? Dylan happily replied, "I had always wanted to create a Willy Wonka-like environment that had oversized candy props. But I wanted to have it feel hip and modern so I combined the entertainment feel with Moma Design, Space Odyssey 2012 film and hip night clubs I'd seen. I was inspired by, as mentioned, Willy Wonka and the Chocolate Factory as well as The Wizard of Oz, Alice in Wonderland, Toys, and all Disney cartons. I created inspiration boards with scenes from these films and other tear sheets." 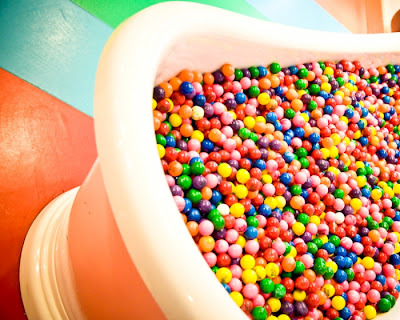 BATH WITH GUMBALL SUDS, ANYONE? 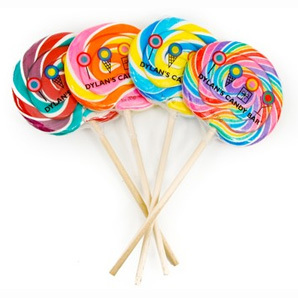 DYLAN'S SIGNATURE LOLLIPOP - DELISH! Dylan's 15,000-square foot Wonkaesque inspired store is jam-packed with thousands of different types of chocolate, sugary goodness, and various candy-related acessories, from T-shirts to jewelry. The Oompa Loompas are the only thing missing! 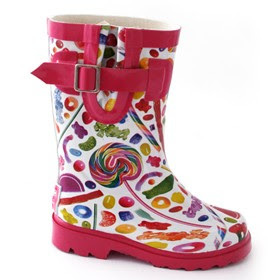 My faves are those adorable candy inspired boots and Dylan's own belgian chocolate bars, yumm, there is over a dozen to try. I have done my own taste testing and the 'best of the best' are the Cookies and Cream, S'mores, Milk Toffee Crunch, and for those bold coffee lovers, Espresso! There is even a Candy Spa, where you can bathe in chocolate with Hot-chocolate bath salts or hot-chocolate bubble bath. Aah, the sweet life! DYLAN'S OWN BELGIAN CHOCOLATE, YUMM! Dylan sure has built a strong lifestyle brand that is visibly integreated into the interior design!! I asked Dylan, what fuels your creative process? 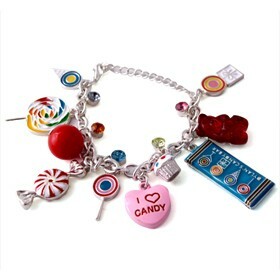 She replied, "candy offers so much to work with. In our meetings we'd get a sugar and creative high eating the candy. 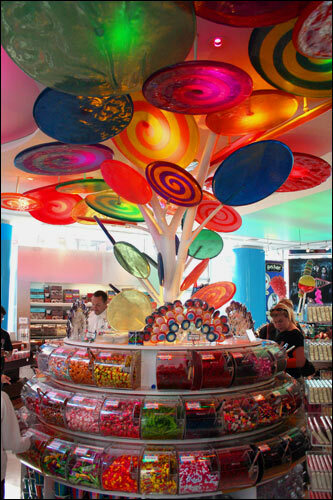 And we also modelled the props, fixtures, architecture, colors, surfaces after the shapes, colors, patterns, textures of candy." What is really most impressive is how the candy is organized and showcased. The backdrop of the store is all white so the focus is on the candy, sort of like a gallery setting. 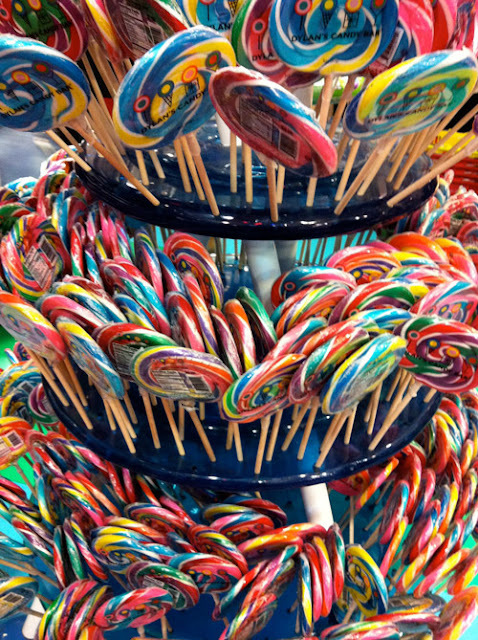 I noticed rows and rows of candy stacked and arranged by color and/or pattern. Not unlike a stack of colored or patterned shirts you would find in a boutique clothing shop. So I proceeded to then ask Dylan, did you find inspiration from fashion? She emphatically said, "definately. I love the colors, patterns, textures of fashion. I try to package candy with an unique design. I also admire the way retailers like my dad (Ralph Lauren) and Izod and Scoop merchandise clothing in color coded ways. Or create a themed environment with props to bring the clothes with that theme to life. We do this with seasonal props and colors to constantly keep the store ambience changing and make the candy of that season have a bigger story." See the wall of M&M bins below where the colors are purposefully placed, overwhelmingly beautiful! 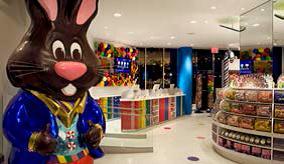 Dylan's Candy Bar is "Pure Imagination." Can you hear the theme song? Every designer can learn from Dylan that inspiration can come in unusual ways. 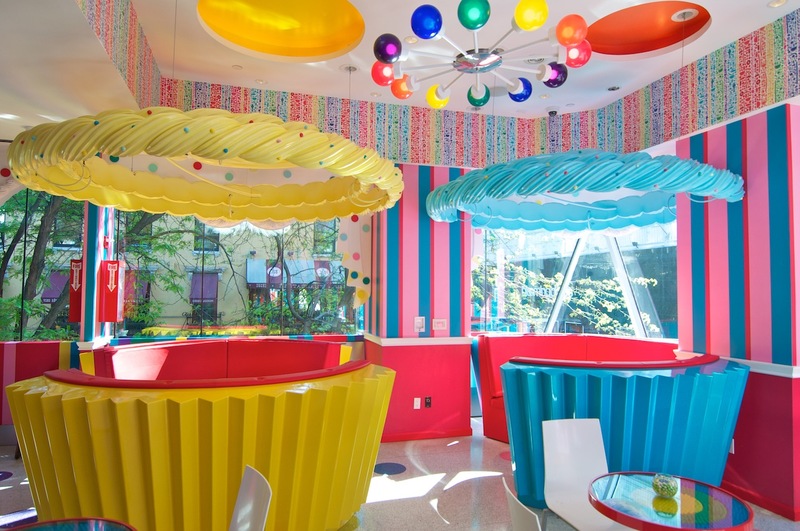 Her appreciation and passion for candy is evident in every aspect of her modern "candyland." 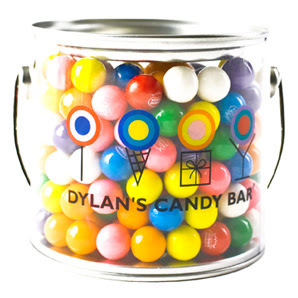 In her book with Sheryl Berk, Dylan's Candy Bar Unwrap your Sweet life, she say, " Candy is magic!, Candy is imagination!, Candy is art!, Candy is fashion!, Candy is joy!, Candy is memories!" AHHH!!! LOVE IT!!! AWESOME!!! Love the placement of the M&M's!!! 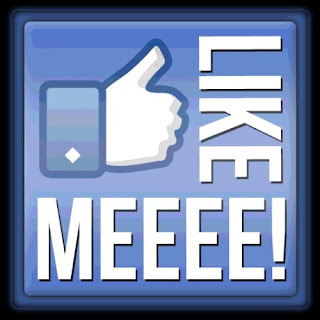 Awesome.nice thoughts on your post. We are really appreciate to you. For maintaining your blog. This is really great job. Are you interested to know about AZ DMV.